What prompted your involvement in the competition? How would you describe the standard of cricket? A lot stronger than I was anticipating, and a lot more competitive. The chance to play Uganda was fantastic as they have a number of talented cricketers. How would you describe the facilities at the ground? The new ground is one of the most idyllic places I have ever played. Fantastic setting and a great wicket. What were your impressions of Kigali and Rwanda? I loved Kigali and was fortunate to have a number of friends who have lived there so we were able to experience all the city had to offer. We then travelled around the rest of Rwanda as a family driving the width of the country from Lake Kivu to Akagera National park. We really knew very little of the country but came back buzzing with enthusiasm, it is a stunning country and has a huge amount to offer. How would you describe the enthusiasm for the game in the country? For those that are involved it is fantastic. Awareness needs to grow as cricket and sport on the whole really is a fantastic way of reuniting people, women and men alike. How do you think the RCSF (now Cricket Builds Hope) are making a difference? I have seen what they are capable of in Rwanda and if this can be rolled out to other developing countries then I think they can make a big difference. As mentioned sport has a huge appeal globally as well as locally and should be used to help reunite people such as in Rwanda. We were first told about the tournament via an email from one of the other teams who participated. One of our team subsequently met with (then Project Director) Alby Shale and got talking about the CBH tournament. The standard of cricket at 2017’s CBH tournament was strong. The teams from East Africa, in particular, provided a stern test for our young squad. We had a brilliant opening fixture against the Kenyan U19s, as well as an exciting third game against the steadily-improving Rwandan national side. The standard of the semi-finals, including a talented Ugandan team, was excellent. The Gahanga stadium is wonderful. The ground is first-rate and set among the rolling hills of Rwanda. The changing rooms at the stadium were a little wet owing to heavy rain during the opening ceremony, but it’s a beautiful place to play and a lovely ground for spectators, too. The Rambler team stayed at the Kigali Mariott and were delighted with our accommodation and facilities there. We loved our time in Kigali and were met by friendly and welcoming Rwandans throughout the tour. The Rwandans that we met at the stadium were incredibly enthusiastic and passionate about their cricket. 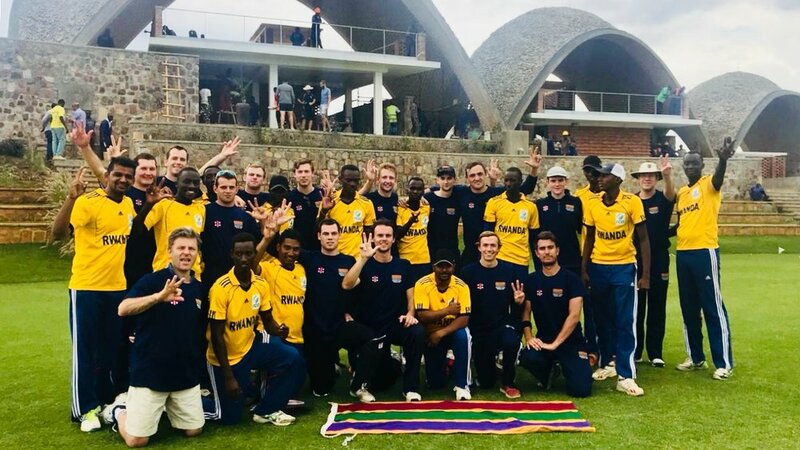 Whilst I don’t think that this is widespread across the whole country yet, the Rwanda national sides that we met (both men and women) are desperate to play more cricket and improve. The energetic and charismatic captains (Eric and Mary) are fantastic role models for cricket in Rwanda and representative of a love of the game for many Rwandans. Cricket Builds Hope is making a difference by giving Rwandans a new and exciting home for cricket in Kigali. More importantly, CBH uses the power of sport to affect social change in a country that, in spite of its troubled past, has an exciting and bright future. The program run by CBH, focussing on leadership for women, is a brilliant example of the important work being carried out by the charity. I saw the original article about the stadium in the Telegraph, and Nick Hoult, the writer, put me in touch with Alby Shale, the Project Director. Personally I found the story hugely inspirational, and when I spoke with other members of the team there was a similar response. This kicked off some significant fundraising activities, including a continuous 51 hour net at the Oval, which took its toll on the team plus guests. From our perspective we wanted to raise as much as we could in advance, and then engage in voluntary work whilst in Rwanda, which we were able to do. The standard was generally very strong, although from our perspective it was good that there were other teams of mixed ability! Being a corporate side we were always going to travel with a side of varying ages and skills, but as our focus was more on the volunteering aspect this was fine. We were competitive for most of the Rwanda fixture and had a couple of good close games. The facilities at the stadium are excellent. The wicket is good with true bounce and the outfield of a very high standard. We also used the nets and these were also very good. The main feature for our side were the incredible views over the rolling hills of Rwanda, and there is also a taste of local life with the market and town within a short walk. The opportunity to play national sides from East Africa at a national stadium was something none of our team thought they would be able to do, and is a never to be forgotten experience. It’s an incredible place with great people who want to help you wherever possible. The country is really safe, and that becomes apparent as soon as you leave the airport. Kigali has plenty to do and is a very interesting place that is clearly growing fast. The rest of the country is well worth visiting – my wife and young children came out and we travelled across to Lake Kivu in the west and back across to the Tanzania border to go on safari to the east. The children found it amazing, especially seeing Elephants and Giraffes at close quarters, but from an overall perspective it was one of the best places we have visited, and we’ll be back. What other activities were you able to get involved in? We were very fortunate in this respect. We joined Umuganda, which is community work that is compulsory for all locals, and spent some time helping to build a local school. We also went to a refugee camp with some cricket kit and saw the enthusiasm of the children, and went and coached at a school just outside Gahanga. All incredible experiences. The potential is there, but it will take time as the game is very new in the country. The enthusiasm and curiosity of the children for the game says that the numbers will grow. It is also great to see the interest on focus on the women’s game, where there is clearly a lot of ability. Phase one has made an enormous difference with the building of the stadium, and the use of this as a community facility. The creation of Cricket Builds Hope and the instigation of their programmes will bring a focus on gender inequality, and bringing confidence to local women in their community. From a personal perspective I have great belief in this work and the work of the charity, so was keen to stay involved, becoming a Trustee of the charity.